On March 29, 2019, the Gulf Coast Ecosystem Restoration Council (Federal Restore Council) approved Alabama‘s State Expenditure Plan for Gulf Coast recovery. This plan, developed by the Alabama Gulf Coast Recovery Council (AGCRC), proposes 28 activities for the Spill Impact Component of RESTORE funding (also known as Bucket 3) for a total estimated cost of $132,355,952. The projects proposed in this plan are all located within Mobile and Baldwin Counties and are consistent with the eligible criteria as stated in the Resources and Ecosystems Sustainability, Tourist Opportunities and Revived Economies Act of 2012 (RESTORE Act), a bill passed by Congress in 2012 in the wake of the BP/Deepwater Horizon oil spill catastrophe. Promotion of the consumption of seafood harvested from the Gulf Coast region. The 28 projects selected focus, in large part, on water quality, park and public facility improvements, and environmental restoration. The 10-member Alabama Gulf Coast Recovery Council was created when Congress passed, and President Barack Obama signed into law, the RESTORE Act. The council comprises the governor, who serves as chair; the director of the Alabama State Port Authority, who serves as vice-chair; the chairman of the Baldwin County Commission; the president of the Mobile County Commission; and the mayors of Bayou La Batre, Dauphin Island, Fairhope, Gulf Shores, Mobile and Orange Beach. Former congressman, and now chief of staff, Jo Bonner serves as Governor Ivey’s representative in her absence. Prior to the BP oil spill, Bayou La Batre, Alabama had experience another disaster, in the form of Hurricane Katrina. 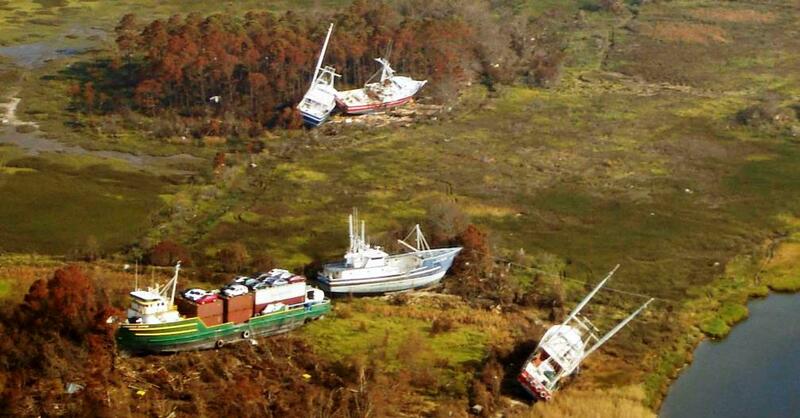 The featured photo (courtesy of NOAA) shows a cargo ship and other boats aground in 2005. The M/V Caribbean Clipper (left) was unloaded by crane six months later and refloated. See final State Expenditure Plan (PDF).